Panasonic is known for quickly refreshing its cameras lineup, especially those at the budget end of the range. 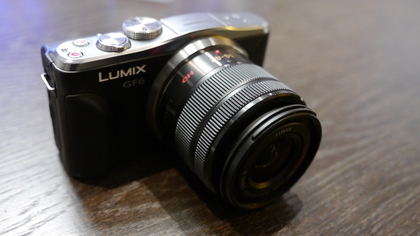 The GF series, which is the company’s beginner option, was last upgraded roughly 12 months ago, so it’s no surprise to see the replacement Panasonic GF6 making an appearance now. However, Panasonic says that although the GF1 was incredibly popular, the GF series hasn’t seen the same level of popularity with the GF3 and GF5. Perhaps this is due to increased competition both within the company – from the likes of the Panasonic GX1 – and outside it, with more companies now entering the compact system camera (CSC) market. On the other hand, perhaps it’s because the GF line never really found its audience, being a little too simple for the more advanced photographer, and too complicated for those stepping up from a compact camera. 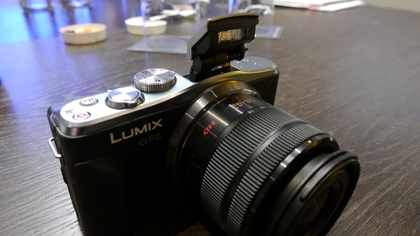 Panasonic has therefore given the new Lumix GF6 a more complete overhaul than previous upgrades. 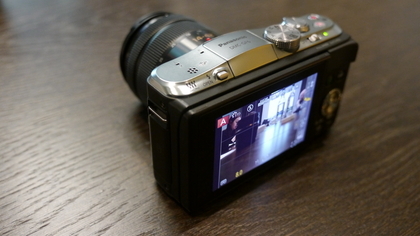 It now includes a 16 million pixel sensor, the same device as found in the Panasonic GX1. The GX1 is scheduled to carry on for the foreseeable future, which may be a disappointment to those who expected to see a replacement by now. Along with the sensor is a brand new Venus engine, and most noticeably a new tilting 180-degree touchscreen and a mode dial on the top of the camera. The Panasonic GF6 includes inbuilt Wi-Fi technology, something that only the high-end GH series had featured previously. Furthermore, it is the first Panasonic interchangeable lens camera to include Near Field Communications (NFC) – a technology that looks set to be making an appearance on more devices in the next few months. This is the same technology that you currently find in contactless payment systems and in several smartphones and tablets (Apple is conspicuous by its absence). It enables you to touch two devices together to instantly share images/videos, without the need to add in passwords or other laborious means. Keen to appeal to the beginner audience, the camera includes even more digital filters than before. These are likely to find favour with the Instagram crowd, boosting the GF6’s offering up to 19 different effects. Interestingly, these filters are now also available on Creative Panorama shooting mode – a feature that first made its appearance on Panasonic’s latest set of compacts, and now finds its way onto its compact system cameras. A new retouch function enables you to do some editing-in camera, with the ability to remove distracting elements such as branches or strangers in the background. All of these improvements don’t come at a price premium, launching at £449 (around US$680 / AU$652) with the new 14-42mm kit lens. This is significantly cheaper than the £579 / US$749 / AU$849 asking price that the Panasonic GF5 launched with, although it’s worth pointing out that the standard kit lens included here is not a power zoom, but instead a new manual zoom option. 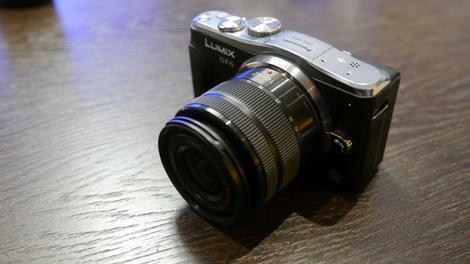 The first thing you notice about the Panasonic GF6, when compared with its predecessor, is its chunkier exterior. 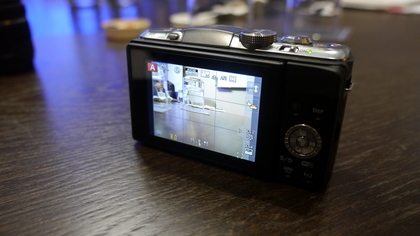 This enables it to fit in the mode dial at the top of the camera and the flip screen at the back of the camera. Some may appreciate these added benefits, but it does mean you’ll need extra space in your pocket. 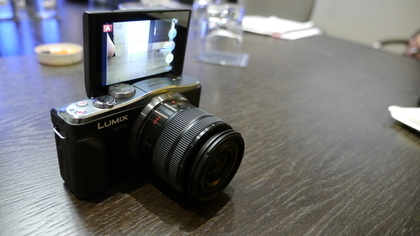 Because it comes with a standard 14-42mm zoom, rather than last year’s ultra slim power zoom, this camera looks more similar to the Panasonic GX1 than the Panasonic GF5. However, the addition of this extra dial on the top of the camera makes it much easier to access the different modes of the Panasonic GF6. Previously you needed to venture into the menu in order to gain access to different shooting parameters. 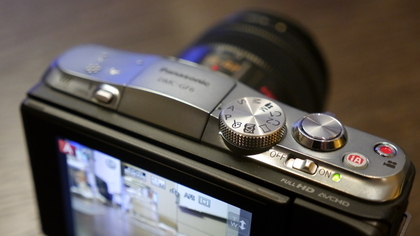 To activate fully automatic mode, there’s a dedicated button just next to the shutter release. This makes it quick to switch from the more complicated modes to fully automatic, and has the added bonus of activating a blue LED light around the button to make sure you’re aware that you’re in the correct mode. Like the Panasonic GF5, the Panasonic GF6 features a touchscreen, and this can be used for a variety of functions including navigating through the various settings and handily changing the autofocus point and firing off the shutter release if you want it to. As with the other G series of compact system cameras, most of the commonly used settings can be accessed via a Quick Menu. Here you have the choice to use either the touchscreen to navigate through the different settings, or, for those who prefer it, the arrow keys on the back of the camera. Panasonic has also found room to add an additional function button at the back of the camera, which you can assign a number of different parameters to. Much of the rest of the navigation of the camera remains the same as previous GF series cameras, with a sensibly laid out menu that’s easy to scroll through to find the options you need. The front of the camera has a grip attached to it, which is moulded to the shape of a finger gripping it. This makes it feel very comfortable and secure in the hand, especially when shooting one-handed. 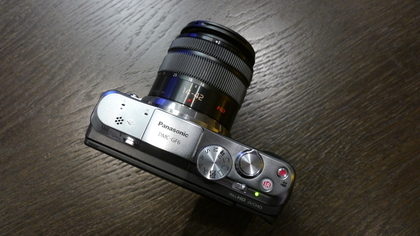 At the time of launch, the Panasonic GF6 is the only interchangeable lens camera to feature NFC connectivity. This means that you can touch the camera to an NFC-compatible device – such as some smartphones or tablets – to have images and videos instantly transfer across. You can also use a smartphone or tablet as a remote control in this way. Because we only had access to a pre-production sample of the Panasonic GF6, we weren’t able to see this in action on the camera. However, we’ve seen it work on the compact Panasonic FT5, and have been impressed by the ease and speed at which it works, so we can see this appealing to those with compatible devices. As it stands, Apple doesn’t have any products equipped with NFC, but the Samsung Galaxy S3 – the world’s best-selling smartphone – does. 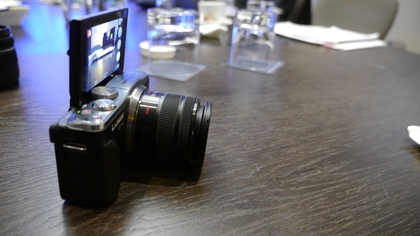 One of the most appealing features of the Panasonic GF6 is its new flip screen. 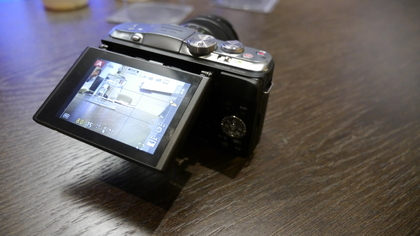 Although it doesn’t offer the same flexibility as a fully articulating device (such as the one on the Panasonic G5), it does keep the overall size down. When the screen is flipped 180 degrees to face the front, it is useful for self-portraits, and by doing this to the screen, the camera will automatically activate self-portrait mode. 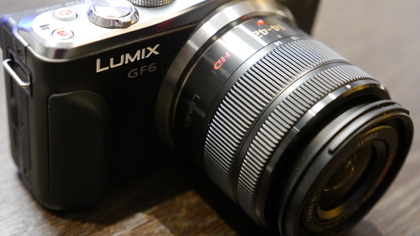 The Panasonic GF6 will come bundled with a new 14-42mm optic, which is smaller than the old manual 14-42mm lens that used to come packaged with G series cameras. It keeps the overall size of the camera down, but if you’ve got extra money to spare, we’d suggest you think about investing in the X power zoom lens, to make this closer to being a pocketable device. It can be difficult to comment on the likely performance of a camera we haven’t yet had chance to test fully, but in the case of the Panasonic GF6, which uses the same sensor as the Panasonic GX1, we can be reasonably confident that it will be a good performer. We’ve always been impressed by the overall standard of Panasonic G series cameras, so to see the company investing more into its entry-level models is encouraging. 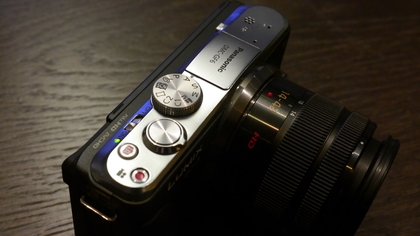 Including a 16 million pixel sensor in a CSC range that previously used a 12 million pixel device makes it more likely to compete in the mind of the consumer with other similar cameras in this segment of the market – such as the Sony NEX-3N. We’ll be keen to see what impact the new Venus engine has on the camera, especially when it comes to low light shooting. We haven’t been able to see the new digital filters in action, but with some creative options such as Bleach Bypass now becoming available, we’ll be keen to put them to the test soon. One of the plus points of Panasonic cameras, when compared to some of the other brands, such as Sony and Nikon, is that creative filters can be shot while shooting in raw format, should you decide you don’t want the filter at a later date. Although we’ve only had a limited amount of time with the GF6, we’ve been impressed by the new electrostatic touchscreen. It seems to be more responsive than its predecessor. It doesn’t seem to suffer too badly from glare and reflections, but this is something we’ll be testing further when we have a full production sample. The new ability to tilt it up and down means that should glare be a problem, you may be able to tilt it out of reflection. It’s important that the screen performs well since there’s no inbuilt viewfinder, and like the Panasonic GF5 (but unlike the Panasonic GX1) there is no hotshoe or port to attach an external device. Overall, we’re confident that the Panasonic GF6 will be a good performer, and it will be interesting to see how it performs in the market. With a new lower price point but the added benefits of a tilting screen, Wi-Fi and NFC, we can see this appealing to the beginner user who wants to have a lot of fun. With quirky features such as creative filters and stop motion animation mode, this is a camera that will be appreciated by those looking for something more optically advanced than their compact or smartphone, but still featuring some of the things that make other devices so convenient. Stay tuned for updates to this review when we get a full production sample in for testing. 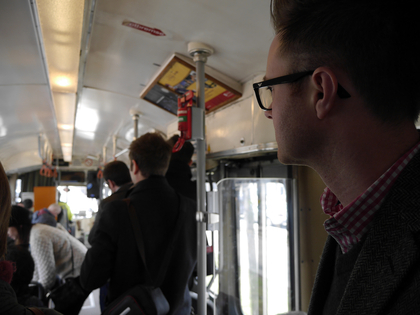 These sample images were taken using a pre-production sample Panasonic GF6 and have been resized to under 5MP at the Panasonic’s request. 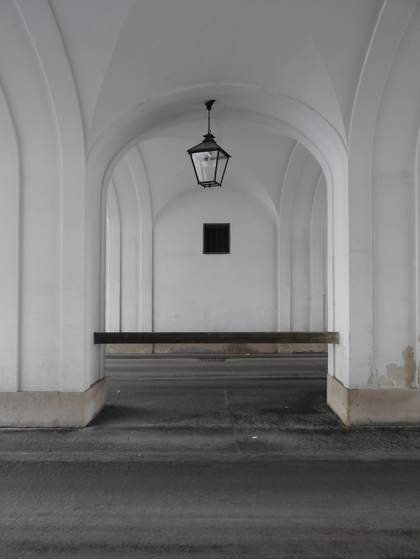 There’s no shortage of detail in this shot taken at ISO 160, the colour and white balance are also accurate. The GF6’s metering has handled this predominantly white subject well and reproduced the subtle tonal variations successfully. 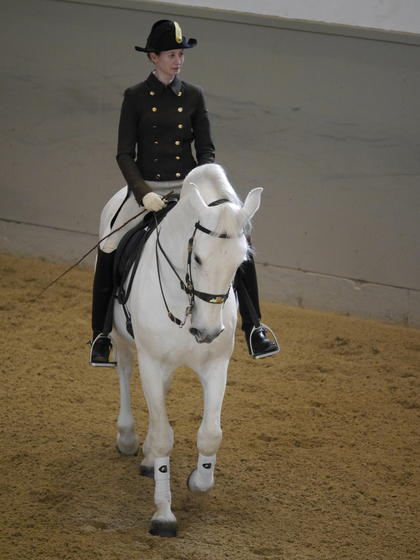 The GF6’s AF system coped fairly well in the relatively low light of the riding school, but examining this ISO 1600 image at 100% on screen reveals quite a bit of smoothing to reduce noise. 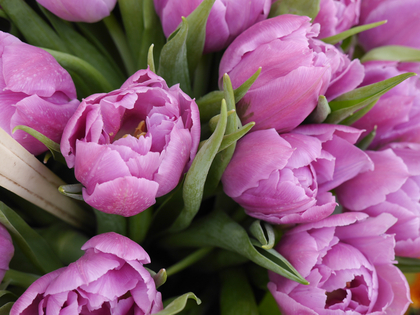 In its standard configuration the GF6 produces natural looking colours. 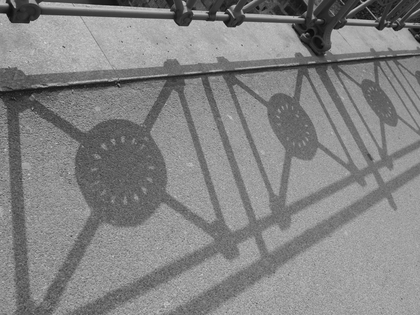 The GF6 is capable of producing nice black and white images in-camera, with a good contrast range. 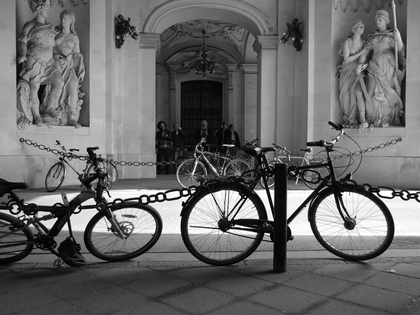 This high contrast scene has been reproduced well. 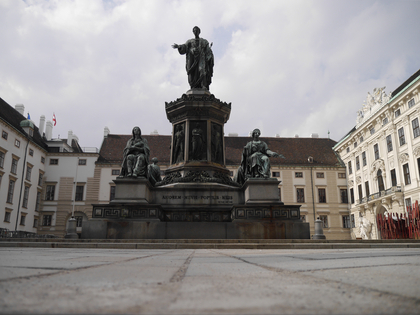 This image was underexposed by 1/3Ev to retain the highlights in the clouds, but there’s still detail in the statue. 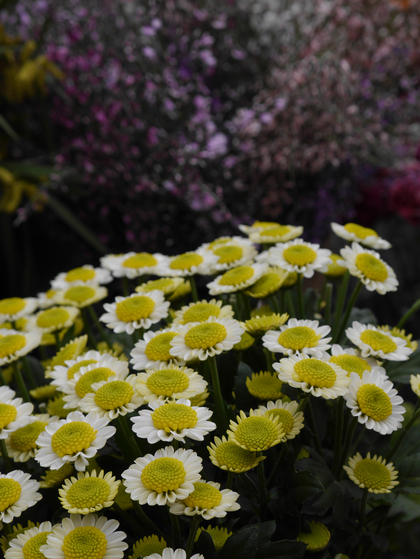 Taken at ISO 200 and f/3.5, this shot has lots of detail and natural fall-off in focus. 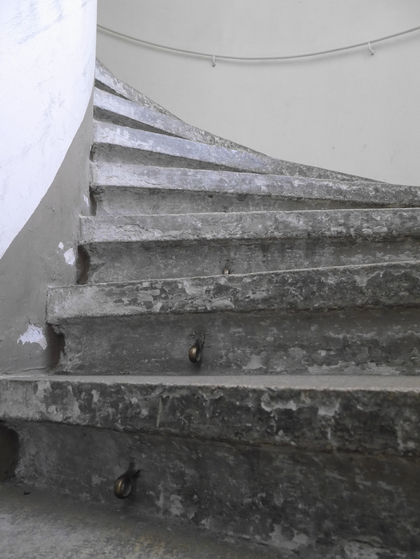 This shot was taken at ISO 3200 and there’s lots of detail in the flaking stonework with little sign of noise.